Random House Trade Paperbacks, 9780812971873, 288pp. From an acclaimed and award-winning young writer comes an intensely moving debut collection set in the eye of life’s storms. In Corpus Christi, Texas—a town often hit by hurricanes— parents, children, and lovers come together and fall apart, bonded and battered by memories of loss that they feel as acutely as physical pain. 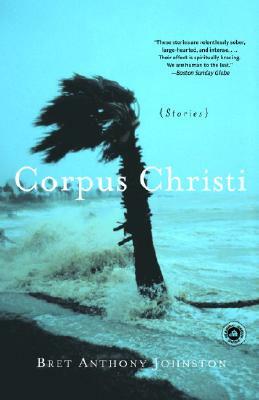 Writing with tough humor, deep humanity, and a keen eye for the natural environment, Bret Anthony Johnston creates a world where where cataclysmic events cut people loose from their “regular lives, floating and spiraling away from where we had been the day before.” Corpus Christi is a extraordinarily ambitious debut. It marks the arrival of an important, exquisitely talented voice to American fiction. BRET ANTHONY JOHNSTON has been featured in The Paris Review and Open City, as well as many anthologies, including New Stories from the South: The Year’s Best, 2003 and 2004; Prize Stories: The O. Henry Prize Stories 2002; and Scribner’s Best of the Fiction Workshops 1999. A graduate of the Iowa Writers’ Workshop, where he received a Teaching-Writing Fellowship, he teaches creative writing at California State University, San Bernardino. "Bret Johnston writes with searing honesty and a deep compassion about the people in his native Texas. This astonishing book will break your heart, make you nod in comprehension, laugh out loud, and ultimately force you to see your own life in a fresh way. The prose is wonderfully precise and the observations are dead-on. Corpus is a brilliant debut by a young writer who has clearly put literature at the center of his life. "Bret Anthony Johnston's stories read as if they'd been written by someone who's lived various lifetimes, time enough to develop real wisdom, generosity and the art of making strong clean sentences. What I especially love about these stories is the fact that many of the characters walk the finest line between violence and love, and they do so with a tenderness that is heartbreaking." "Bret Anthony Johnston is a name to put on your list--that list of writers you always read first. He knows how you can despair of people and go on treasuring them--hard-living, hard-headed, unexpected people who look out of his stories like brightly lit signposts on a dark highway. 'Look here,' they say. 'Right here.'" "In his first collection of stories, Bret Anthony Johnston eloquently depicts individual lives at once haunted and painfully enriched by memory, and by the losses of which memory is made. A wise and moving debut by a talented young writer."